Figure 1: “How do vendor services compare?” for fully rated vendors. Data from Figure 1 on Page 118 of report Best in KLAS Software and Services 2019. Arcadia’s #1 ranked value based care services enable health systems to effectively share risk. Arcadia’s team is committed to ensuring organizations are economically successful in value-based care models. Provider-centric services ranging from contract negotiation to care management are supported by insights from Arcadia’s market-leading population health management platform, Arcadia Analytics. This combination of deep expertise and sophisticated analytics ensures providers and administrators can effectively and efficiently engage patients and manage risk. The recognition as Best in KLAS validates Arcadia’s years-long commitment to provide value-based care organizations with a platform that combines deep managed care knowledge, healthcare data analytics expertise, and unparalleled technology capabilities. The annual Best in KLAS report ranks health IT software and services vendors across market segments. The report, published by KLAS® Research, recognizes outstanding efforts to help healthcare organizations in their quest to deliver quality patient care. The Best in KLAS designation is awarded only in those software and services market segments that have the broadest operational and clinical impact. Figure 2: “How do vendor services compare?” Arcadia letter grades. Data from Figure 1 on Page 118 of report Best in KLAS Software and Services 2019. In addition to displaying the overall KLAS score for each product, KLAS provides letter grades for each product to help provide better context and transparency of product performance. In addition to the Best in KLAS recognition, KLAS recently rated Arcadia among the best value-based care and population health management tools and services in two separate reports. 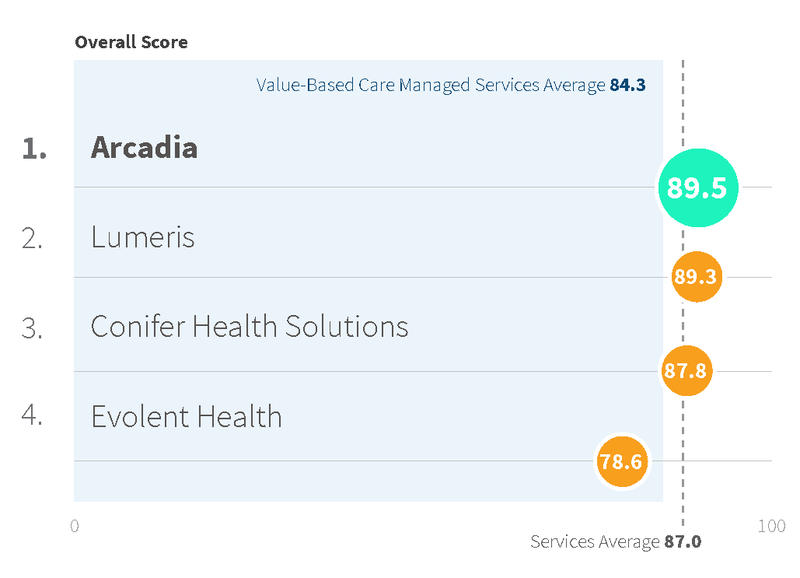 Arcadia was fully-rated in both Value Based Care Managed Services 2018, where it scored highest among all full-service value-based care managed services vendors, and Population Health Management, 2018, where it was the strongest fully-rated population health management vendor for financial outcome success. As part of the KLAS 2019 Value Based Care Managed Services report, Arcadia customer AMITA Health was spotlighted for the success they have experienced while working with the Arcadia’s team. AMITA Health, the largest health system in Illinois, leveraged its partnership to generate nearly $60 million in savings last year for the Medicare Shared Savings Program (MSSP). As a result of the collaboration, AMITA Health Accountable Care Organization will receive shared savings of $27.3 million from CMS, the highest amount earned by any ACO in Illinois and the third-highest among the 472 ACOs nationwide that participate in the shared savings program. Arcadia (www.arcadia.io) is a population health management company, specializing in data aggregation, analytics, and workflow software for value-based care. Our customers achieve financial success in their risk-sharing contracts through Arcadia’s focus on creating the highest quality data asset, pushing expertly derived insights to the point of care, and supporting administrative staff with data when and where they need it with applications including care management and referral management. Arcadia has off-the-shelf integration technology for more than 40 different physical and behavioral health EHR vendors, powered by machine learning that combs through variations in over 50 million longitudinal patient records across clinical, claims and operational data sources. Arcadia software and outsourced ACO services are trusted by some of the largest risk-bearing health systems and health plans in the country to improve the bottom line. Founded in 2002, Arcadia is headquartered outside Boston in Burlington, MA, with offices in Seattle, Pittsburgh, and outside Chicago in Rockford, IL. Value Based Care Managed Services 2018, Page 5. Population Health Management 2018, Part 2, Page 4. Value Based Care Managed Services 2018, Pages 24-26. Value Based Care Managed Services 2018, Page 25.